These designer pipe hangers are perfect for pairing with our 3D Textured Slatwall. Made from 3/4" in thick steel pipe and available in 2 ft, 3 ft and 4 ft widths, these pipe hangers can perfectly accent your unique merchandise. 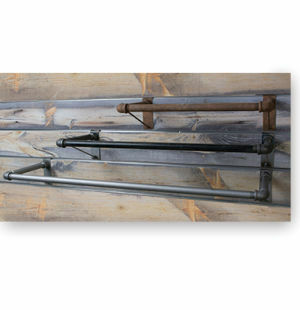 These hangers come in Black, Bronze, Sandblast or Rust. We also sell these hangers with shelves included. Go here to purchase hangers WITH shelves. See our entire catalog of Textured Slatwall products here.